By the time a princess does some unspeakable things with a catfish about half way through the latest film by the acclaimed auteur Apichatpong Weerasethakul (he’ll tell you just to call him “Joe”), you are firmly in his absurdist, but slightly calming ground. The Thai filmmaker, known for his striking films Tropical Malady and Syndromes and a Century, has returned to a character who was referenced in Malady, and formed an entire story with monsters, ghosts, doubles, and other strange sights and dialogues. Yet Mr. Weerasethakul is not just putting the grotesque in our face to confound and play with us; there’s a philosophical and political stance behind every moment of his film, and even if it doesn’t work, he’s a fascinating filmmaker. Those not used to Mr. Weerasethakul’s filmmaking style may find it jarring, or perhaps boring, but both couldn’t be further from the truth. At times he is riveting, such as a long descent into a cavern that feels like a journey through to the afterlife, surrounded in darkness instead of life. Or in a shocking moment, in which characters suddenly see themselves in their old positions, watching an alternate present, and perhaps a nod to Syndromes. Mr. Weerasethakul jumps through stories of immigrations, the troubles of monk life, and yes, the sometimes graphic connection between humans and nature, including the beasts that inhabit them. Yet Uncle Boonmee Who Can Recall Past Lives does not solidify anything in a straight interpretation, and finding the visual clues that link sequences together is a fascination as well, such as a moment near the end where bright red lights shine in a restaurant, matching those of the Ghost Monkeys starring from the forest. The film is a little more meandering than Mr. Weerasethakul’s previous films, and seems to jump through ideas and philosophies of death a little too quickly. In fact, if anything, the film is a little too stuffed. Tropical Malady kept everything centered on the relationship between the two men—even if one was a tiger for half of it. But in Uncle Boonmee, Mr. Weerasethakul has no problem diverging into issues of Laotian immigration, or simply showing us how sweet the honey from Thai bees are. Mr. Weerasethakul though is not one to waste any moment, except to immerse you in a culture. That culture may include water buffalo, soldiers hanging out with giant apes, and meditations on cinema itself, as all part of what it means to live in the Northern area of Thailand. 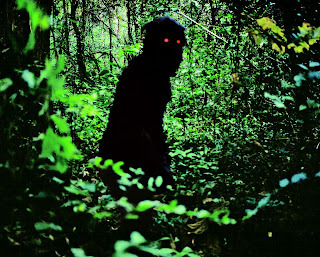 Uncle Boonmee can bring back the culture through memory, and manifest itself on the screen, which is what Mr. Weerasethakul seems to find fascinating. As the film’s credits end, we hear the production turning off camera, and ending for the day, as someone leaves the camera’s sound recorder on. It’s not a self-reflexive moment for the sake of being clever; it’s a reminder than we too are always watching the past, finding the culture that we’ve left behind, and want to return to by the end, which for Mr. Weerasethakul, is best described as a circle.